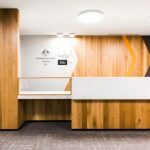 The IA Design team were appointed by the Department of Education (DoE) to consolidate and redesign their existing Brisbane space into a contemporary workplace that reinforced their organisational goals and objectives. Following extensive consultation with all user groups, the IA Design team worked with the Local Accommodation Committee at the DoE to develop a number of guiding principles to drive the design of the new environment. These principles focused on efficiency & practicality, flexibility & reusability, engagement & connection, collaboration & communication, and health & wellbeing. In line with these guidelines, the IA Design team consolidated four floors down to two, conducted a full floor refurbishment on Level 5 and a part-floor refurbishment on Level 8, and adopted innovative design solutions to address each focus principle. The hexagonal floorplan was successfully transformed into a series of curved built environment pods containing meeting spaces, offices, breakout spaces and other amenities. Artificial ‘skylights’ and glazed partitions were introduced to counter the lack of natural sunlight, and a connection with the outside environment was developed through integrating indoor planting and a ‘green’ feature wall. 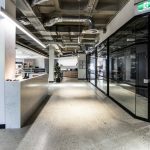 The end result was a successful transformation of the existing workspace into an environment that felt new, innovative and exciting to the DoE team.